ACD Corp (head office: Koto Ward, Tokyo, Representative Director: Mr. Yasuhiro Sonoda), which is invested by ANA Holdings ANA, leant from Korean corporate, ASIAN CONSULTING GROUP (head office: Seoul, Korea, Representative Director: Mr. Kim Tae Woo), with whom we are planning to have business tie-up as local marketing partner in Korea in the areas of EC and settlement for ANA CARGO DIRECT business, that it has intention to acquire coins of ACD COIN in bulk through TOB for the purpose of enhancing the cooperation and establishing further strengthened business tie-up in ANA CARGO DIRECT business and crypto currency settlement business which we intend to expand in Japan and Korea in an interactive manner down the road and we have agreed to accept such friendly TOB to work on EC business in Korea in a smooth manner and promote the introduction of ACD COIN in Korea. We have already agreed with ASIAN CONSULTING GROUP to have business tie-up in promoting ANA CARGO DIRECT business in Korea and settling medical expenses at KOREA MEDICAL PARK, VIP medical treatment facility by ACD COIN and aim at expanding EC and settlement service business in Korea. Those who wish to participate in TOB shall make entry through below URL. The result of TOB will be informed only to those who are chosen in TOB through preliminarily registered emails. Address：♯620. AcetechCity2cha.13gil-25, Sunyu-ro, Youngdeungpo-ku, Seoul, Korea. ACD Inc. (funded by ANA Holdings) CEO Yasuhiro Sonoda and Bitcoin.com CEO Roger Ver has signed MOU (Memorandum of Understanding) on January 19, 2019 regarding comprehensive strategy to increase ACD coin value issued by ACD Inc., upon switching ACD coin to Bitcoin Cash based platform. This agreement aims on supporting ACD’s activity regarding ACD coin through development assistance and reinforce partnership between both companies before substantial business operation anticipating early completion of Bitcoin Cash based ACD coin development set forward by ACD Inc. and Bitcoin.com. ACD Inc. and Bitcoin.com is announcing short term roadmap according to this agreement. Effective dates on each agenda and other details will be announced accordingly. Also Bitcoin.com CEO Roger Ver has expressed to hold ACD coin in the future and provide full support. 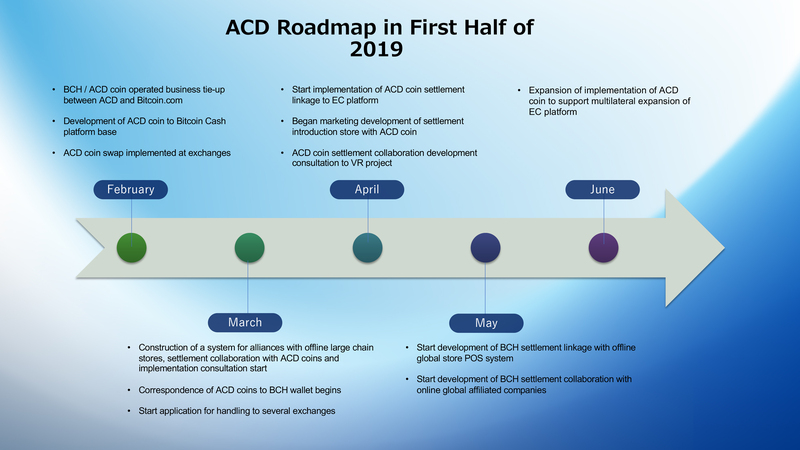 He also has decided to move on with future developments of ACD coin according to below roadmap. Hereafter, ACD Inc. and Bitcoin.com will aim to improve convenience of ACD coin by spreading use of ACD coin and Bitcoin Cash. ACD INC. (Head Office: Koto Ward, Tokyo, Mr. Yasuhiro Sonoda, Representative Director, hereinafter referred to as “ACD”) has decided to form partnership with Lung Fung Pharmaceutical (Group) Ltd,（hereinafter referred to as “Lung Fung Group” ）, one of the largest drug store chain operator in Hong Kong and agreed to offer service to enable its customers to use “ACD Coin”, crypto currency (utility coin) issued by ACD as a method of settlement at all of its drug stores as a part of trial to enhance user-friendliness of stores and improve the sales and commence such service in sequence from early 2019. Lung Fung Group is engaged in business of distribution and retailing covering medical goods, health and health supplement foods, skin care and personal care products with 27 year business track record. Lung Fung Group is currently operating 18 drug stores in New Territory region and aims at expand proactively its business in Mainland China and Macau market in addition to Hong Kong. Moreover, ACD Coin is crypto currency (utility coin) which has been developed to enhance the convenience of cross-bordering service especially for overseas holders of coins through tie-up with BCH (Bitcoin Cash) platform. We plan to make use of ACD Coin to enhance synergy effect at a maximum in inbound business with worldwide off-line stores including drug store chains and plan to improve its convenience and utilization ratio hereafter. Through such engagement described above, we would like to further enhance the tie-up with Lung Fung Group in the future and make an effort to encourage broad use of ACD Coin in Hong Kong and expand its use all over the world. ACD Corp., (Head Office : Koto ward, Tokyo, Representative director: Yasuhiro Sonoda, hereinafter referred to as “ACD”) concluded the exhibition contract on 17th of December, 2018 and this is toward the application of border transgression EC for China, called “ACD MALL” managed by ACD. ACD concluded the contract with Corp. Patisserie Ginza Sembikiya (The head office: Ginza, Chuo-ku in Tokyo CEO: Mitsuru Saito Corp. Patisserie Ginza Sembikiya Hereinafter, will be called “Patisserie Ginza Sembikiya”) which is a subsidiary company of Corp. Ginza Sembikiya (The head office: Ginza, Chuo-ku in Tokyo CEO: Mitsuru Saito Corp. Ginza Sembikiya Hereinafter, will be called Ginza Sembikiya). Ginza Sembikiya is known as a shop that specializes in fruits. By this alliance, Patisserie Ginza Sembikiya began to sell products for the first time towards Chinese consumers via “ACD MALL” from 9th of January, 2019. Previously, Patisserie Ginza Sembikiya only expanded within Japan’s borders or EC internet resale. However, we aim to sell, promote and raise awareness of a brand via new touch point technology. In future, ACD aims to make border transgression EC satisfactory. This is not only for China but it is also for border transgression EC service and we will expand around the world. Company Name：Ginza Sembikiya Corp,. Ltd. The concept of Business operation: In 1894, Corp. Sembikiya home office set Corp. Ginza Sembikiya set up business. In 1913, we opened a teahouse as our first business that sells fruit. This is the first store in Japan (according to Ginza Sembikiya’s research). Professional connoisseur carries out to sell food and fruit which is mainly locally sourced and some imported fruit at a shop that specializes in fruits. Company Name：Patisserie Ginza Sembikiya Corp,. Ltd. The concept of Business operation: It is established as a subsidiary company of Corp. Ginza Sembikiya in 2008. We carry out to develop and sell original sweets which use fruit. The aim is to encourage people to find a familiarity with the fruit. Through this initiative, we will start to sell products, mainly baby-star series and bread snack confectioneries to overseas consumers at the Oyatsu company’s flagship shop at B to C.
Oyatsu Company and ACD are not only making efforts into transboundary EC but we are also expanding international promotions based on regional revitalization. This is in the hope that the additional finances gained from increased tourism in the Mie Prefecture can contribute to its revitalisation while also promoting sales of a local specialty. Company Name: Oyatsu Company, Ltd.